How I healed my suicide son after his death. "An extraordinary book ... The best I have ever seen for people who have suffered through having a member of their family committing suicide." - George Ritchie, author of Return from Tomorrow and Ordered to Return. Doré Deverell's son Richard had led a difficult life, plagued by physical and mental illness and depression. When he committed suicide at the age of 36, Doré was naturally devastated, suffering the intense anguish of a mother's loss. But she was determined to seek for healing and reconciliation. 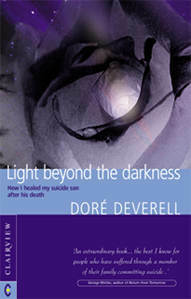 This book is the first-hand account of how Doré Deverell made contact with Richard after his death. Encountering the work of the spiritual teacher Rudolf Steiner, she discovered methods by which she could communicate with her son's spirit. Suicides, she learnt, often experience great suffering and regret as a consequence of their premature death. But Doré was taught how to alleviate Richard's pain, and finally to metamorphose it. These practical steps are described here in an accessible way to aid anybody who finds themselves in a similar tragic situation. In the unexpected conclusion to this extraordinary tale, Doré finds the person who, she believes, embodies Richard's reincarnated soul. Her work is rewarded with new hope, and Richard's soul is given a chance to learn and develop on earth once again. Light Beyond the Darkness is a gripping account of love, despair, death and resurrection. Its central message - that, through the spirit, light overcomes dark - is a heartwarming confirmation of spiritual reality.